For the last 3 days we have had issues connecting with RDP through our Remote Desktop Gateway. I’ve used both RDCMAN (Remote Desktop Connection Manager) and plain MSTSC where it’s crashing. It’s been happening quite regularly with the latest build (10041) of Windows 10 but also with a Windows 8.1 client. In my case it’s sometimes been possible to connect to some of the servers but not others. And I’ve at times been able to stay connected for shorter periods (5-30 sec) before the client crashed. I did a quick usermode debug of the crashing application and found out that in both cases it’s a DLL file for MSTSC that’s causing the problem and it’s related to UDP Traffic. 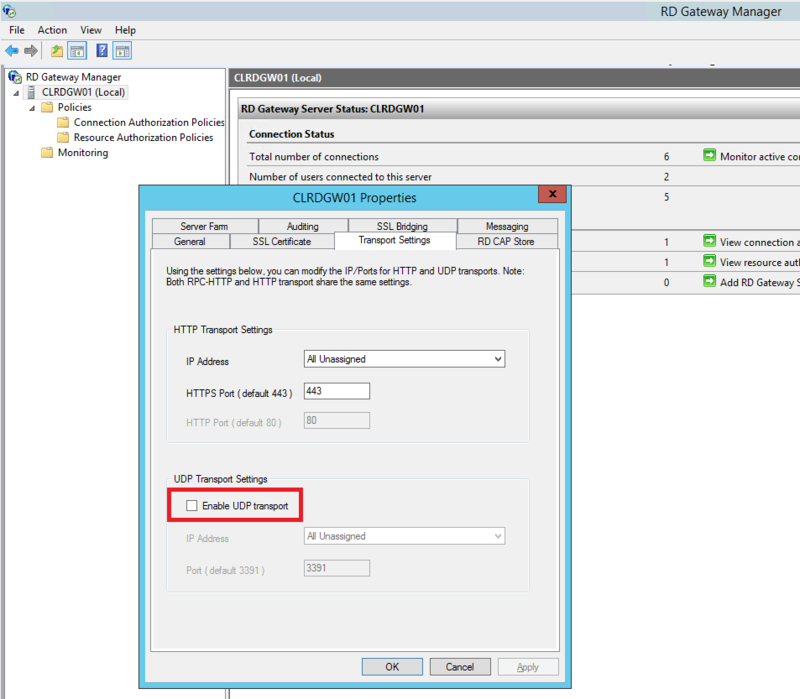 Disabling UDP in the Remote Desktop Gateway seems to solve the problem short term. I’ll have to look into it more in depth later on, but for now I’m at least able to keep on working. Author Markus LassfolkPosted on 2015-03-26 2015-03-26 Categories Windows 8, Windows Server 2012 R2Tags Crashdump, networking, RDGW, Remote Desktop, troubleshooting, windows2 Comments on MSTSC and RDCMAN Crashing? I’m often using Remote Desktop Gateways to connect to various environments, including our Private Cloud. One challenge arises when I change IP-address or network settings on a computer through SCVMM. As the RDGW has cached the DNS entry and IP Address, it takes a while until that information is cleared and I’m able to eastablish a connection. Or to be fair, what I usually do is RDP into the RDGW and does a “ipconfig /flushdns” and then reconnect the first server. It does work, but wouldn’t it be better if that was kind of done automatically. Well, I guess you could schedule a “ipconfig /flushdns” every X minutes and get the desired result. A better solution is to reduce the DNS Cache timeout on the RDGW server! I’ve modified mine to cache entries for just 10 seconds, and then do a new DNS query. 10 Seconds might be a bit too aggressive though it works fine for me. Restart the “DNS Client” service to take effect. (net stop dnscache & net start dnscache). I’ve only tried this on Windows Server 2012 R2, but I guess it should also work on Windows Server 2008, Windows Server 2008 R2 and Windows Server 2012. Personally, I’ve set this key through Group Policy Preferences to make sure it’s always done, even if the RDGW Server is reinstalled. The other two values; MaxCacheEntryTtlLimit and MaxNegativeCacheTtl are leftovers from my testing, it seems those values worked for “Windows 2000” and are not used anymore.